I don’t know where I first heard about the one word concept. One word to use as my theme for the year, to create around, use as inspiration, dream about, meditate on and be and do. I do remember that I simply adored the idea. To me it’s so much more possible than New Year’s resolutions. 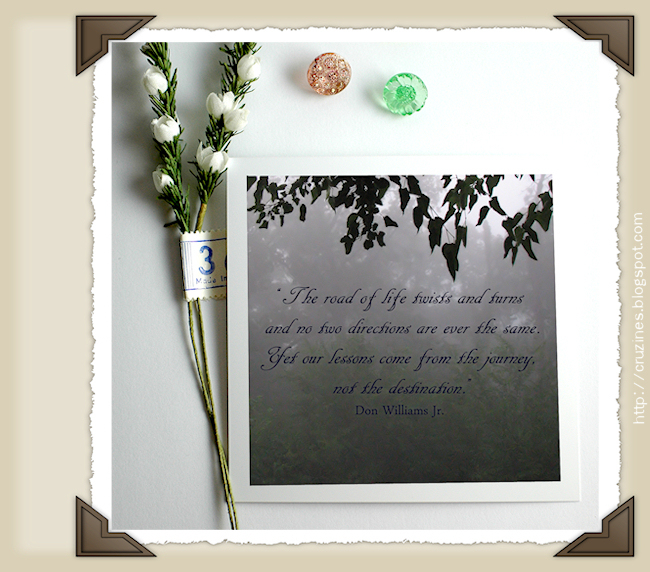 “The road of life twists and turns and no two directions are ever the same. Yet our lessons come from the journey, not the destination.” Don Williams Jr. I don’t want to become so focused on my destination that I forget to embrace the journey. In my journey I hope to travel old paths and find new ones and not be afraid of what lies beyond the next turn. I must have faith that regardless of where the path takes me, I will find my way. My journey will be a quest of and for imagination and creativity. My journey will take me to new places, new people, new thoughts and ideas. My journey’s path is unknown but I am confident it will reveal itself as the road unwinds. I know the journey will be an adventure and I can’t wait to see where it will take me. I will be using journey and all the words and themes it inspires for me as prompts for artwork when I need a little inspiration. It will be interesting to find out where I’ll be at the end of the year. Have you chosen one word for 2013? I’d love to hear about it if you have. Posted in Tori Beveridge and tagged art, art prompt, artist, artistic, artwork, goal, inspiration, journey, one word, Tori B.